Duke Ellington & Chicago, ‘We Love You Madly’ (‘Billboard’ magazine, February 10, 1973). 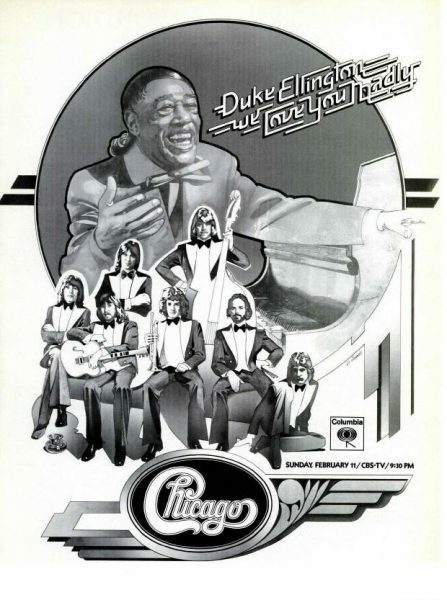 On Sunday, February 11, 1973 CBS TV aired a star-studded special entitled Duke Ellington…We Love You Madly. Among those paying tribute to The Duke were the band Chicago. Here’s a rare clip of the group performing Ellington’s “Jump For Joy” on the special in question. I’ve always thought Terry Kath was the Chicago lead guitarist, so I’m surprised to see him tickling the ivories as another dude bends the strings here now.